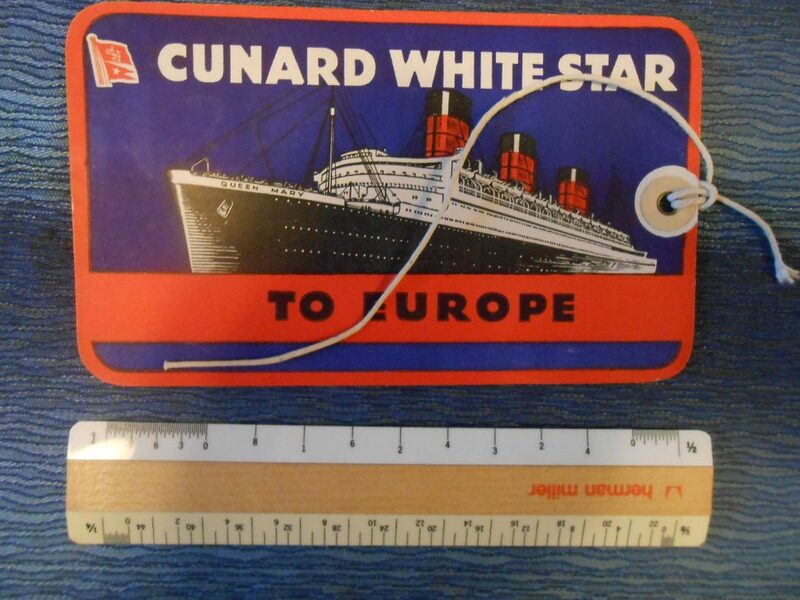 Superb Queen Mary baggage tag … and in excellent shape. Great colors and Graphics .. you can’t beat this if your a QM fan. 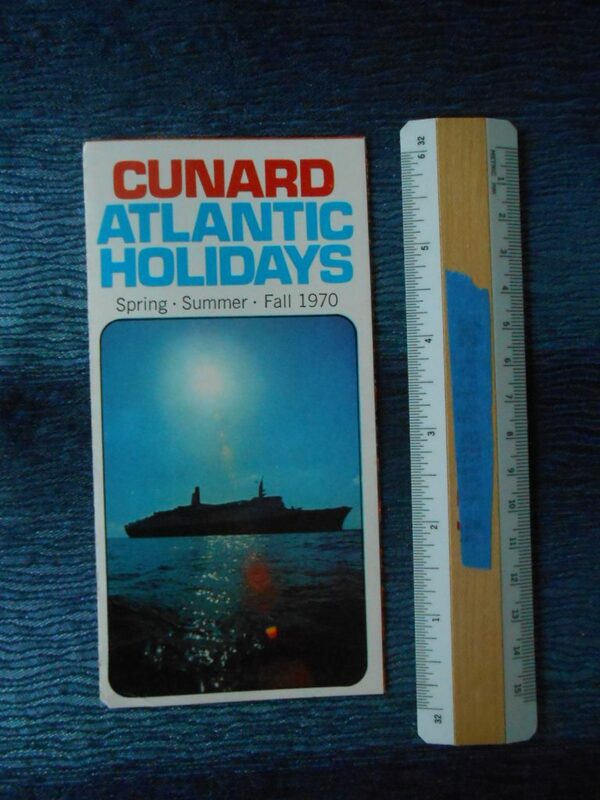 Great little QE and Carmania/Franconia fold out … advertising Atlantic voyages and Bermuda holidays. 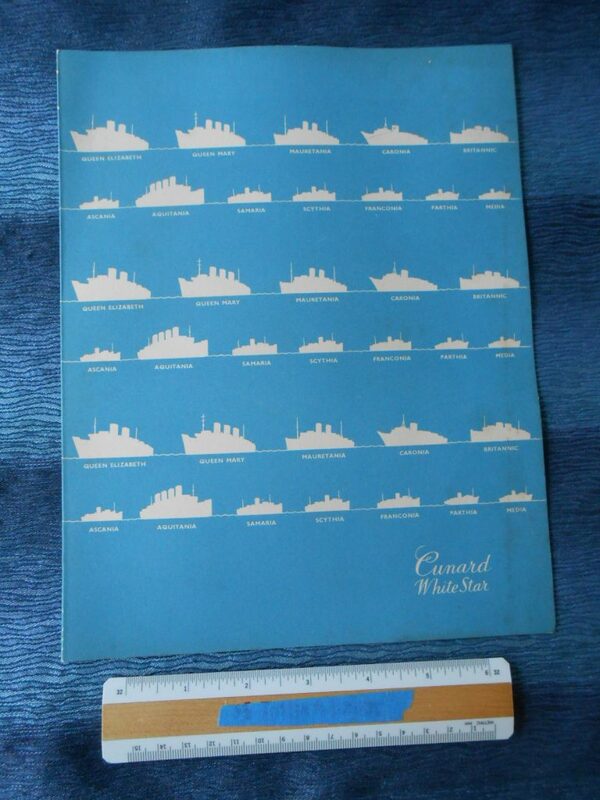 Lovely menu for June 12, 1950 .. a little yellowed inside … but the real treat here is the cover … which shows profiles of the early Post WW2 fleet. The only ship missing is the Georgic which was making austerity voyages for the Government. 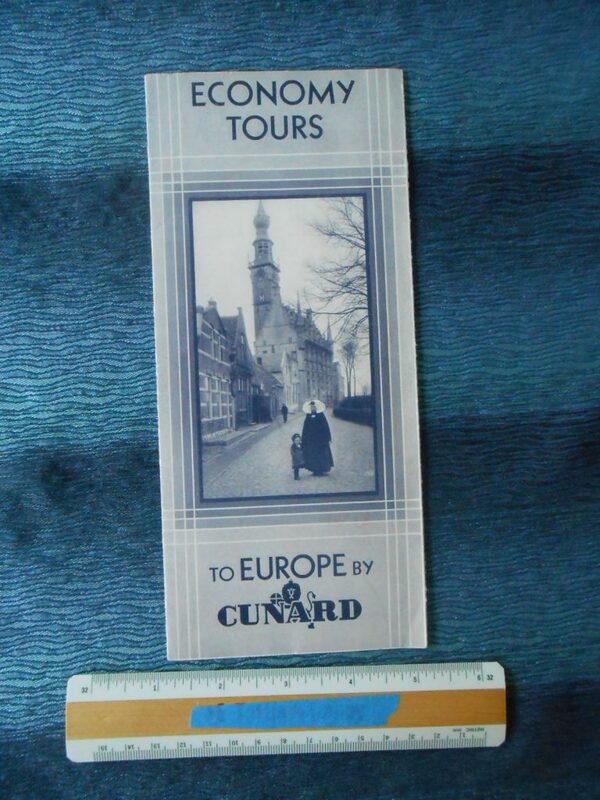 Interesting little booklet brochure for the tourist class interiors of the Queens, Mauretania, and Britannic. 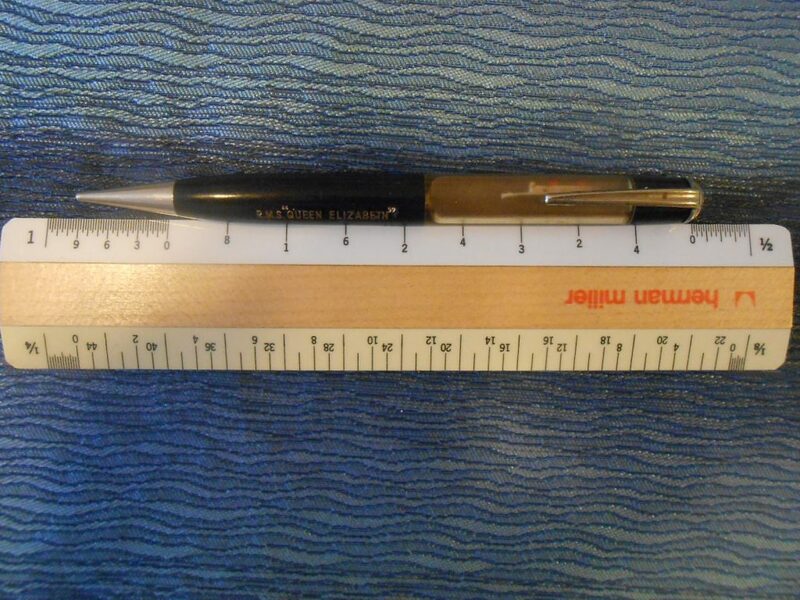 Great condition with a little scuffing normal to a 60+ year old document. There is a Pottstown Pennsylvania Agency Stamp on the back cover. 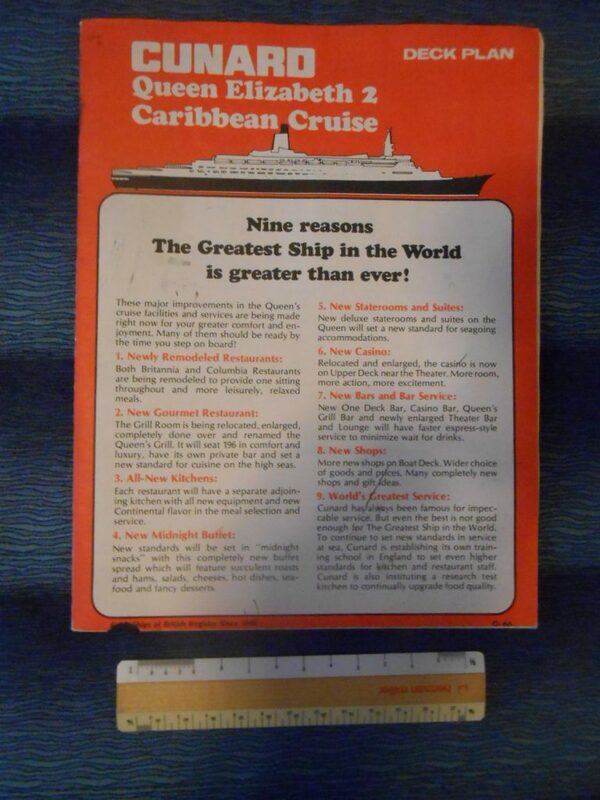 Interesting little booklet brochure for the post war fleet ships and their interiors and amenities. 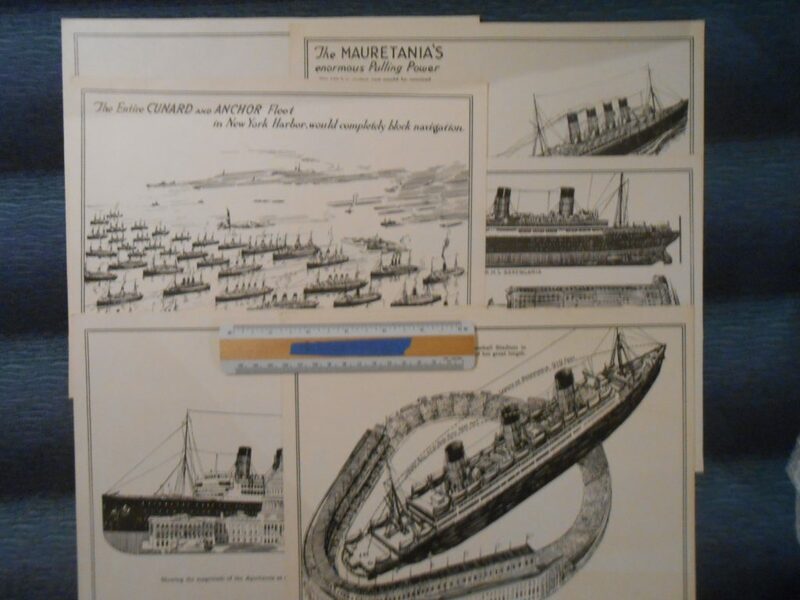 Covers the Queens, Caronia, Mauretania, Media/Parthia, Britannic. 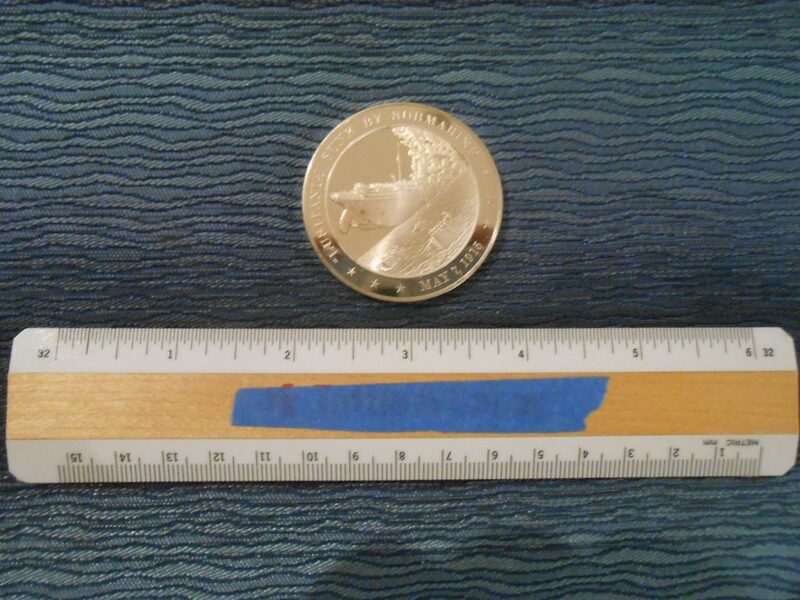 There is a small rip to the cover .. otherwise normal wear and includes an agency Stamp from Reading Pennsylvania. Interesting certificate for 1000 pounds of tock purchased in 1950. 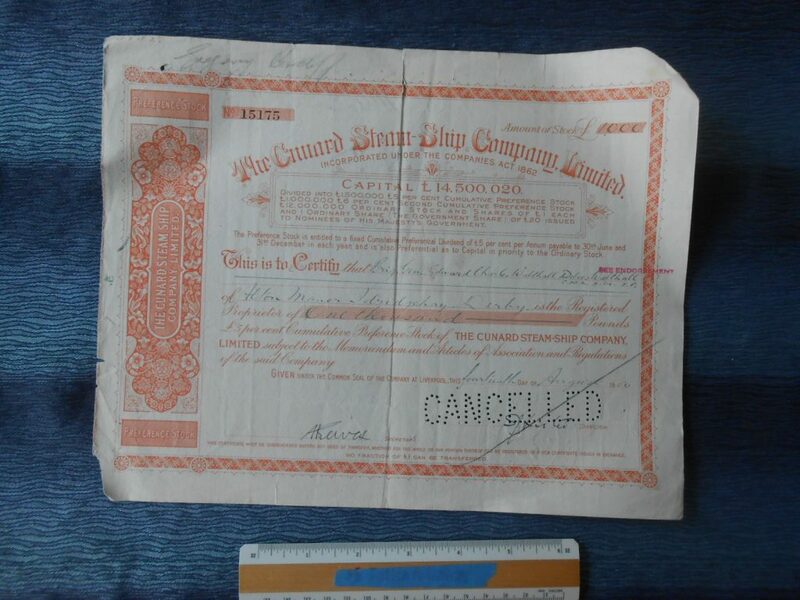 Per the notes on the back it was cashed by the probate court in 1962 after the owner passed away in 1961. 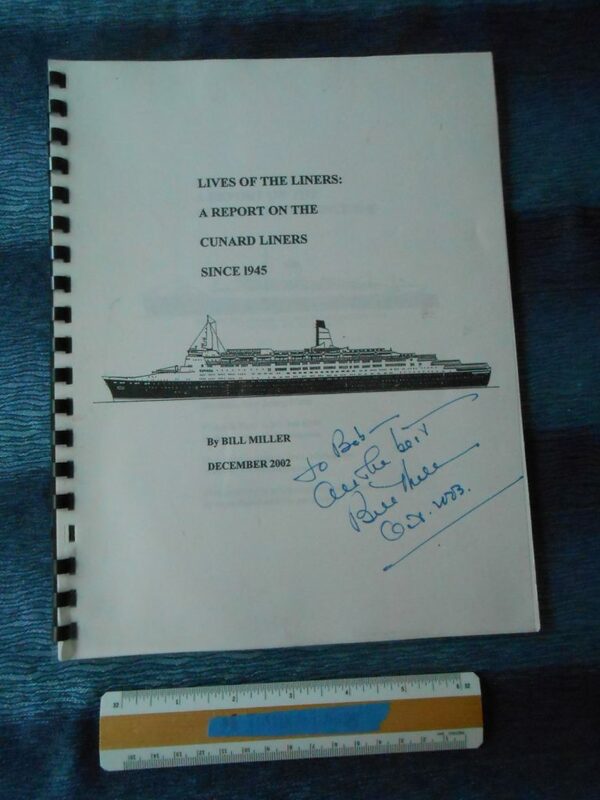 Cunard Line: Lives of the Liners: A report on the Cunard Liners since 1945. 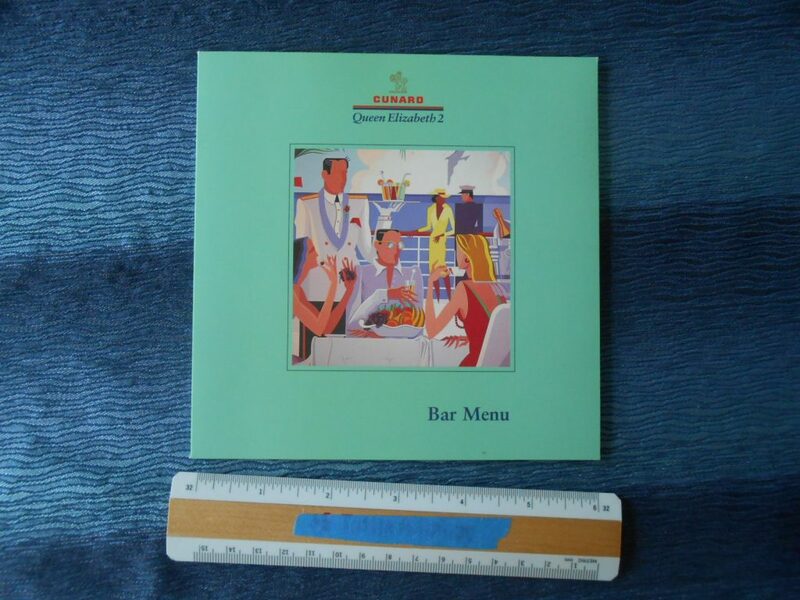 Nice 28 page booklet put together by Bill Miller … probably for a lecture series he gave on board the QE2. 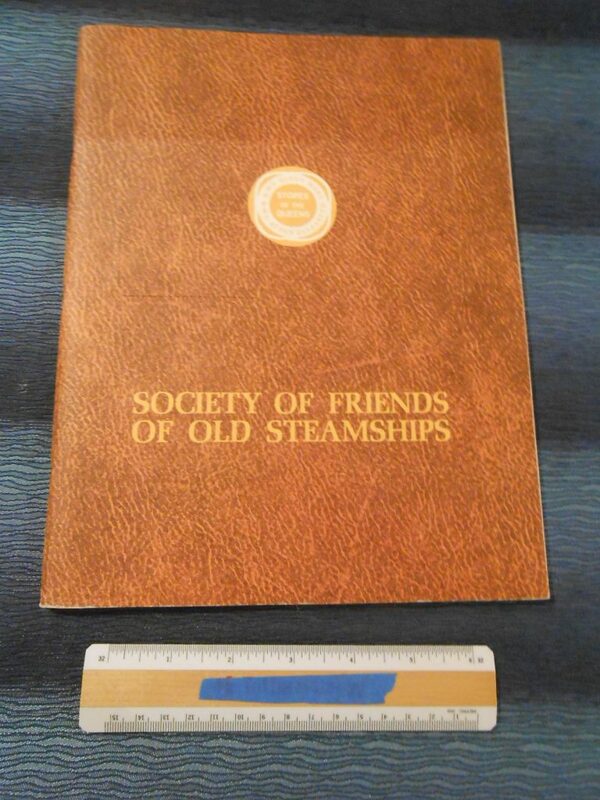 Features several short stories and photocopied drawings of the ships. Inscribed by Billie himself in 2003. 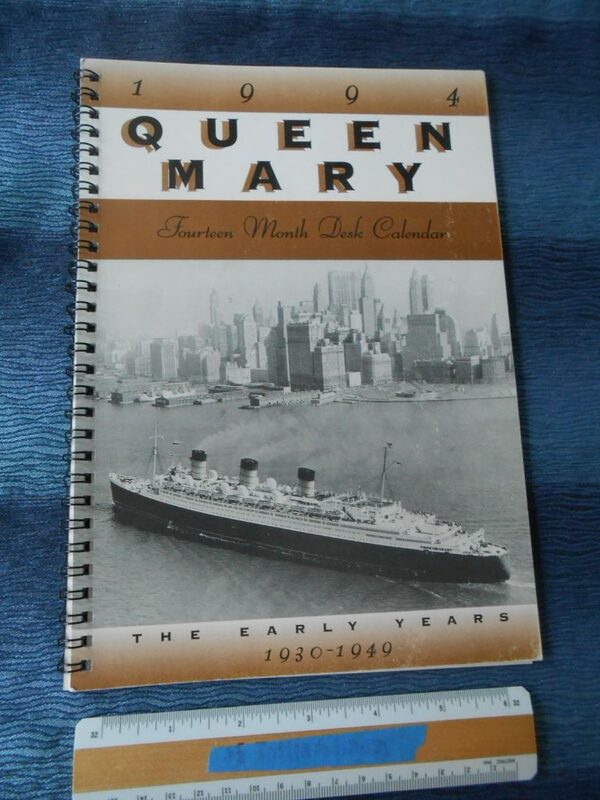 Lovely Calendar planner bought onboard Hotel Queen Mary. Like New condition and each month has a photo image from her early years. 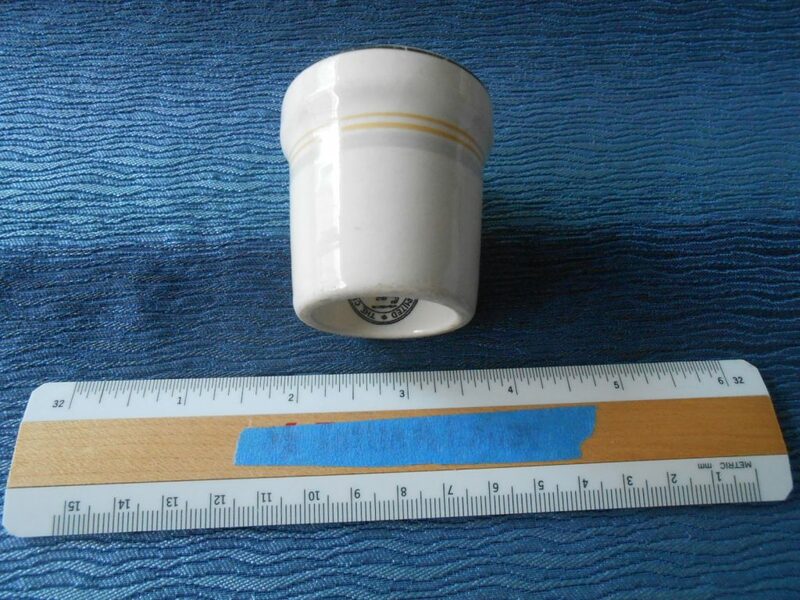 Excellent onboard service Eggcup by Maddock … super durable. 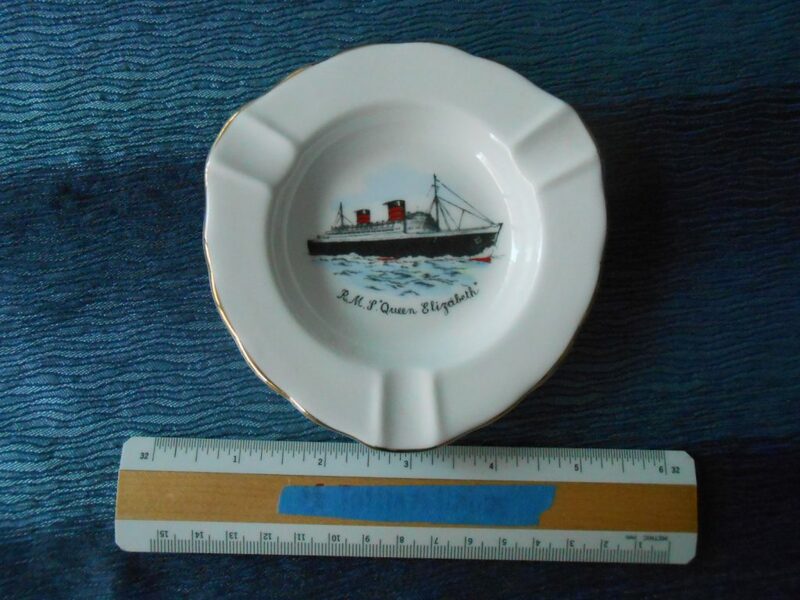 Lovely onboard souvenir ashtray for the Q … made form Quality Salisbury china. Excellent condition. 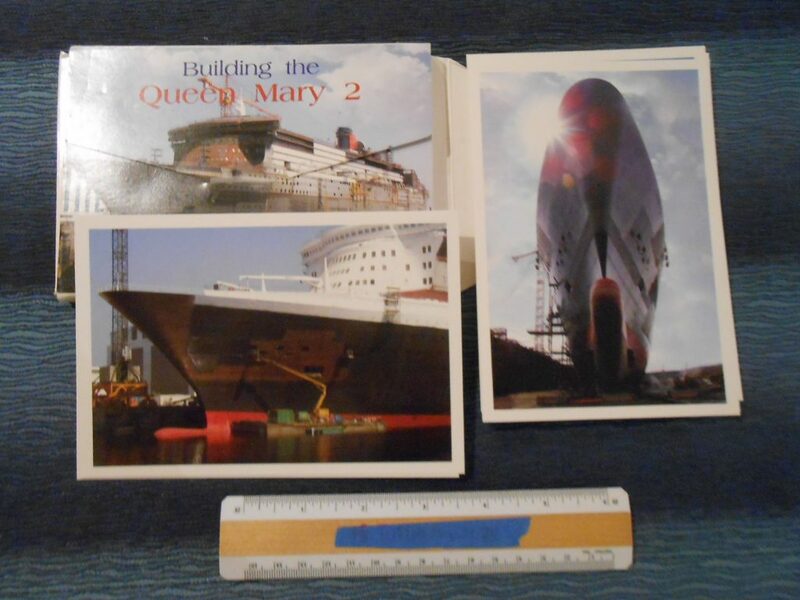 Nice set of 18 postcards covering the building of the Mighty QM2… very nice images that could be framed. 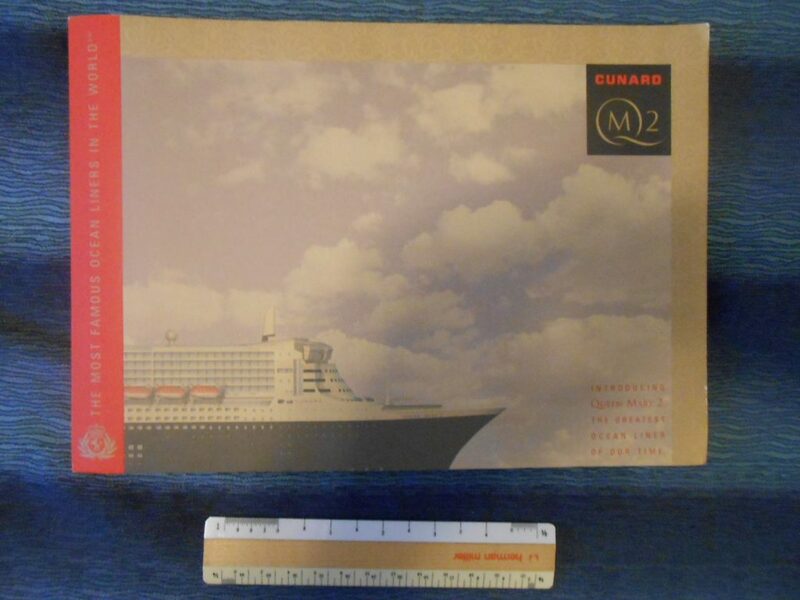 Little cobalt blue and gold boxed soap from the QE2 … highly perfumed and just gorgeous! 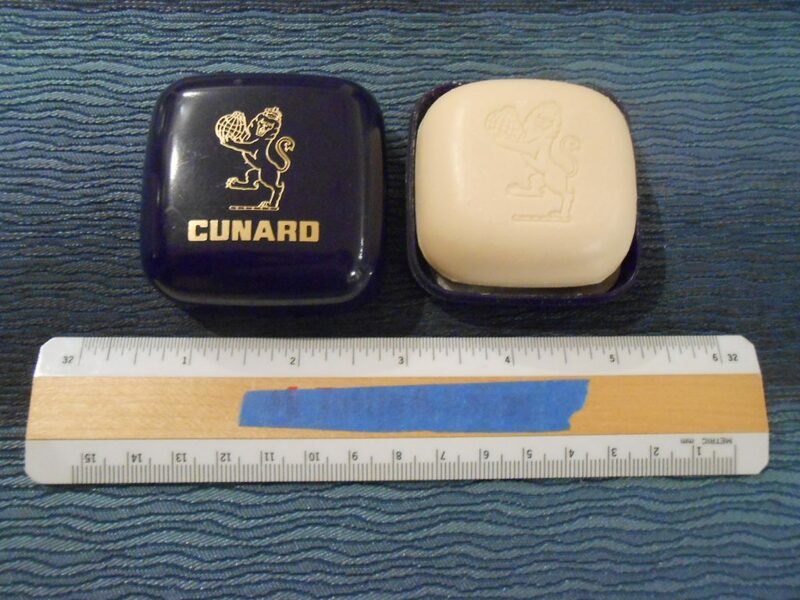 The Cunard crest is stamped into the top of the soap. 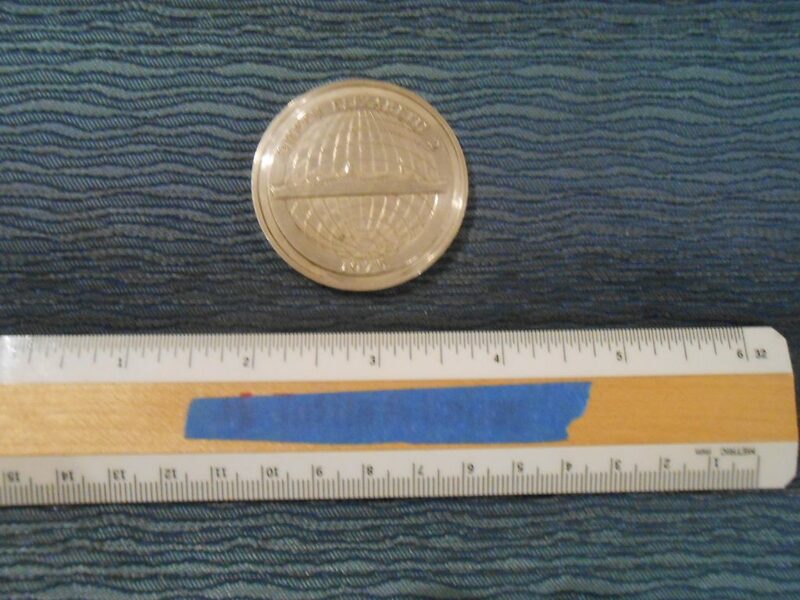 Lovely medallion to Commemorate the QE2’s 1975 World cruise. 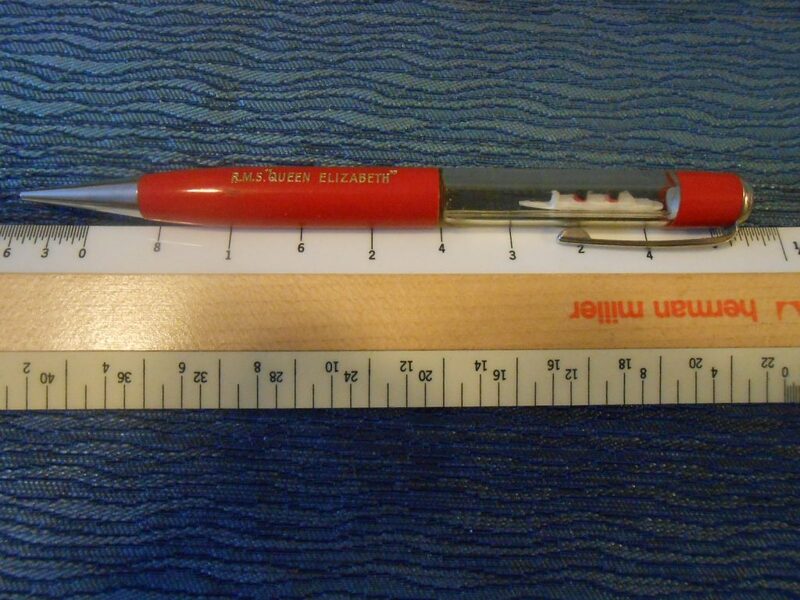 These continue to be popular souvenirs .. often encased in plastic. Modern medallion to Commemorate the loss of the Lusitania. Excellent condition! 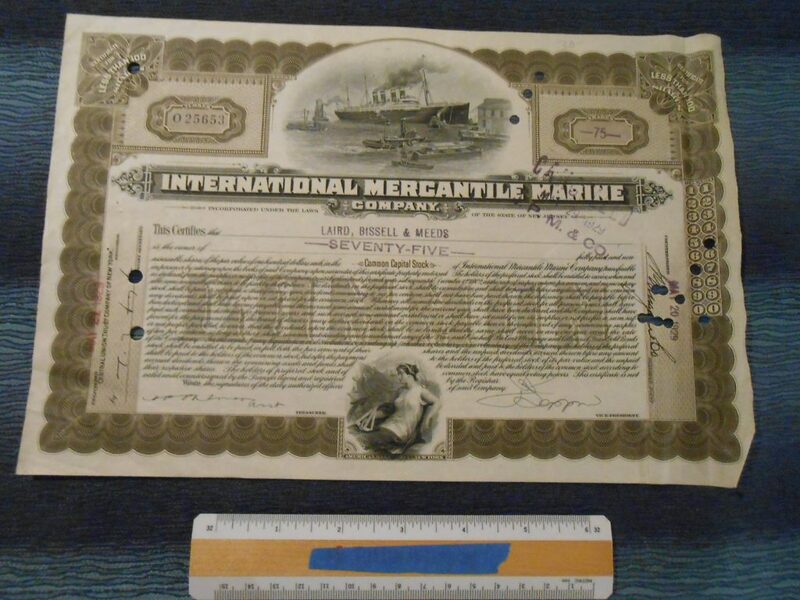 75 shares of IMM stock would have been a nice little investment back in the day … now just interesting to collectors for the 4 funneled ship image and its tie to the historical company. one edge of this is a little wrinkled .. but could be flattened easily (especially if framed). The 4 funnel ship is a nod toward the Olympic … but looks a bit more like one of the German 4 stackers. 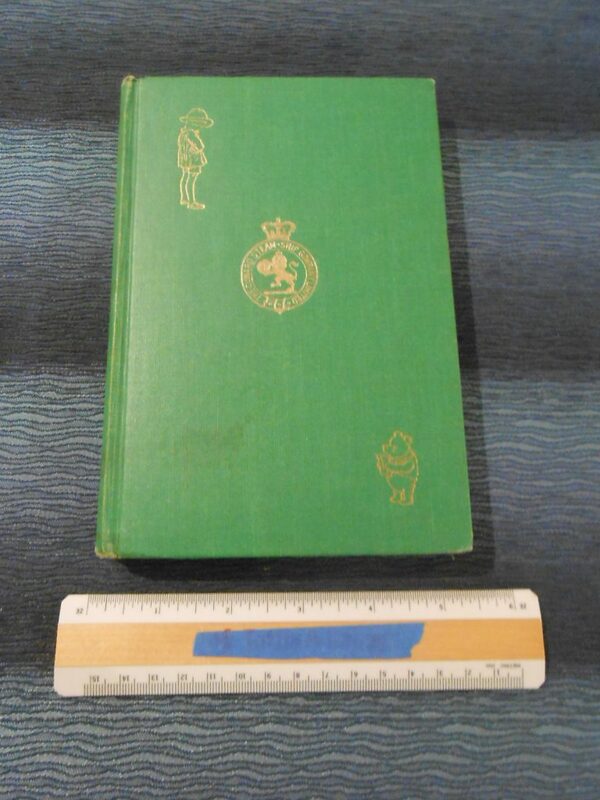 Lovely and favorite children’s Novel “The House at Pooh Corner” stamped with the Cunard gold crest on the cover and inside “Queen Mary Library.” In great condition, it was probably a very popular book with traveling Nanny’s to lure the little ones to sleep. Greta condition! 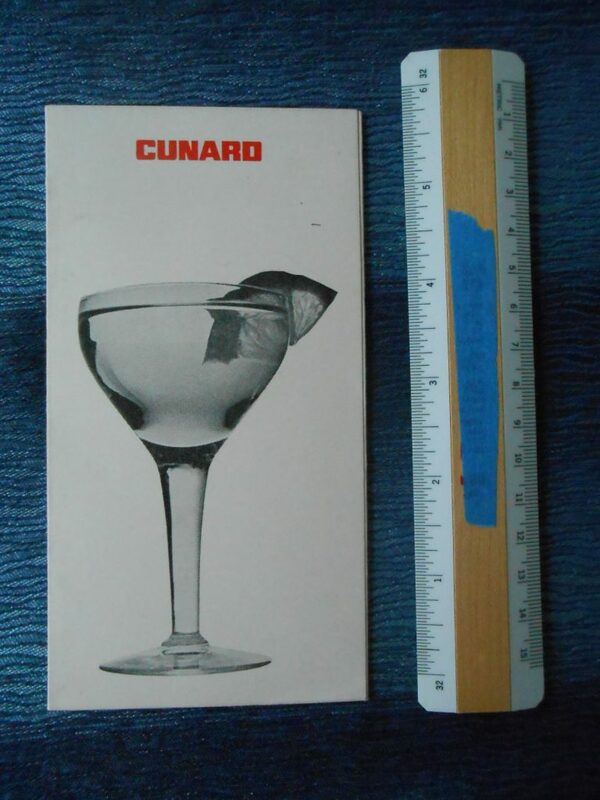 The culmination of selling tools for Gene Darcy’s Ocean liner “wares” would be this catalogue he produced showing many of the items available for purchase. 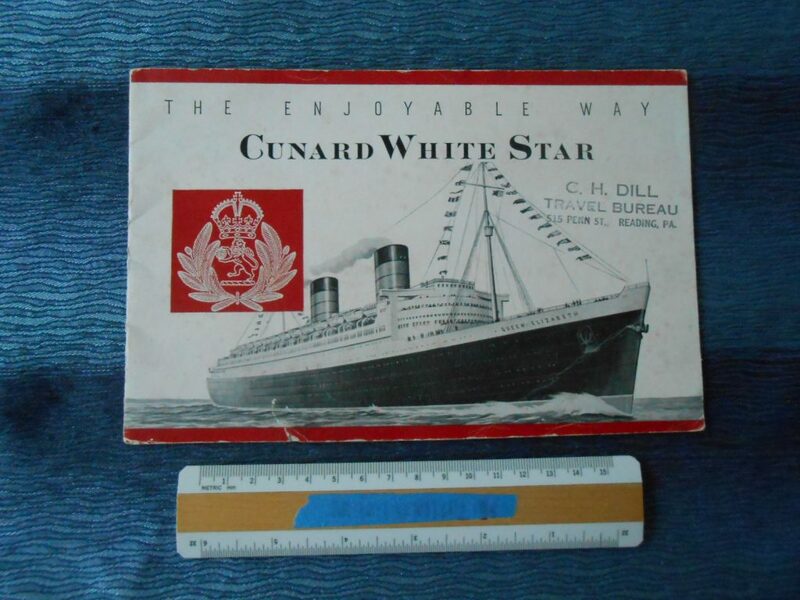 He started is company selling items scrapped from the Queen Mary in Long Beach and then added other ships and items after the initial sales successes. From the somewhat humble start, greed and growth soon set in and many of the later items he added have been proven to be of fictitious historical provenance .. though some of these later “replica” items have now become collectible as well. 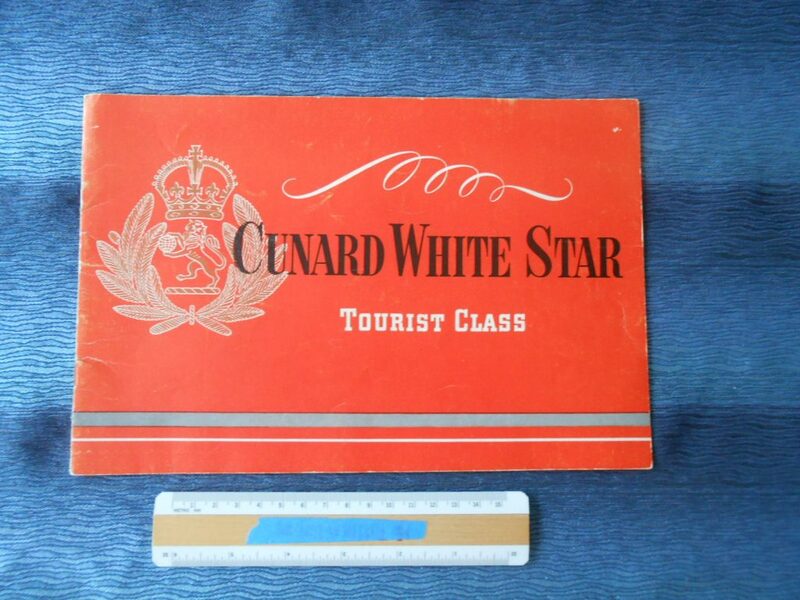 The catalogue is in excellent condition and provides a fantastic glimpse into items sold.